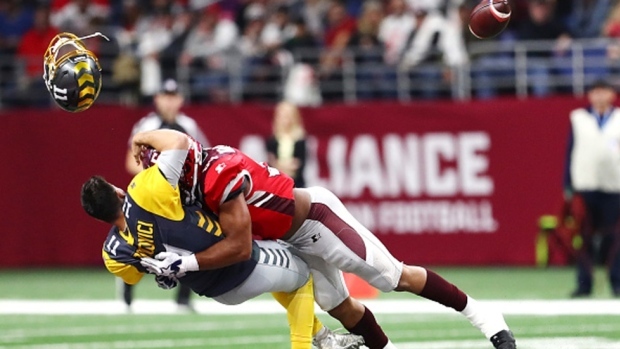 The Alliance of American Football, founded as a complement to the NFL, opened play on its inaugural season on Saturday night, and already the new football league has made an impression. These guys are out here hitting hitting. Shaan Washington absolutely lit up Mike Bercovici on a sack, even sending the helmet popping on a clean hit. You know, the NFL’s sudden roughing-the-passer emphasis last season was probably a well-intentioned one, but after some of the controversy we saw that involved questionable consistency on calls and for some players a perceived lack of leeway even on textbook hits, maybe it’s just relieving to see somebody light another dude up, no flag. They’re having some fun out there. In the other game of the AAF’s opening night, the Orlando Apollos ran their own version of the infamous Philly Special play — let’s call it the Orlando Special.